Hello to all my readers, here I am back with a new but little bit short story for you. Today I came back not with a funny story or not with the moral story. I am presenting a short emotional story. I am hundred percent sure that my story will be going to be very much inspirational for all the son of their father. Continue reading it, and I am sure that when you complete reading the story, you will come to know about the strong bond in the relation of a father and a son. A son has taken his very old father to the nearby restaurant for a dinner on the eve of Christmas. The father was very much old and weak. In the restaurant, while eating the food, the father dropped the food on his dress. The other people who were eating their dinner started looking at those in disgust, but the son remained calm and quiet. After they have finished eating their dinner, the son without getting embarrassed quietly took his father to the wash room. He wiped out the food and had removed out the stains. He then combed the hair of his father and fitted the glasses softly. They both returned back to their table. While coming to their table, people into the restaurant were watching both in a dead silence. The people were not able to grasp that how a person itself can embarrass publicly. Then the son finally settled the bill of the dinner and started getting off from the restaurant along with his father. 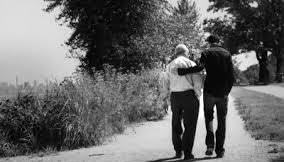 The son replied softly to the old man, “No uncle, I am sure that I haven’t left anything behind in the restaurant”. The old man smiled and replied back to the son, “Yes, you have left something here that is a lesson for the son of all father as well as a good hope for all fathers”. This way all sons sitting inside the restaurant understood the bond in the relation of father and a son. I hope that you might have surely enjoyed reading the story and have learned something very much important. I promise you to be back soon with more such wonderful story.